The Chronicles and learnings of a 40 year old DM, playing with 8 10-year olds. Save me! I’m currently playing Hoard of the Dragon Queen with my sons and 5-6 of their friends in the past few posts. It’s been fun. 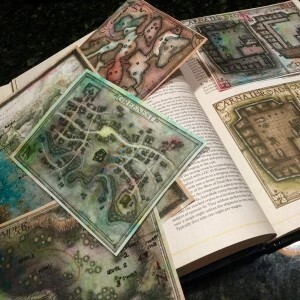 DM Tip: If you’re playing Hoard of the Dragon Queen, go read Mike Shea’s series offering suggestions on how to run Hoard of the Dragon Queen now, then come back after you’ve read it. (It’s that good). We are currently on Episode 3: The Dragon Hatchery. They are resourceful: today, a Raptoran character (played by a 9-year-old) flew up to a mage on an overhead ledge in the Temple of Tiamat during the middle of the battle with Langderosa Cyanwrath, grabbed the mage with his talons and swung him into the statue of Tiamat across the room killing the mage. Impressive. They love being OP (stands for over powered) and having lots of healing potions available. They don’t stop to rest unless I make them, and they have more fun when they’re battling 3 Ambush Drakes, a Roper and 6 Kobolds. They’re a little impatient. The 9-year-old playing the Raptoran asked me if his PC could fly yet every session until he hit level five. Now it’s like a whole different player has showed up to play. 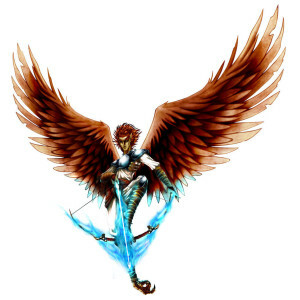 (Next time, I might just start a Raptoran with flying skills… or move the level requirement down to level 3. If it makes the play more fun, I’m all for it. I’ve also got an 11-year-old that really wants a staff for his Wizard PC. He’s asked to find a staff during the last two sessions. I’m going to have to figure out he’ll find one during the next session… It might have a funny curse on it. He’d play that up hilariously. These kids love understanding the game, but are totally willing to make it up. I had two players casting Acid Splash today. One was rolling 2d12 for damage. The other was rolling 2d6 for damage. Since I’ve delegated most of the “rules moderation” to the kids, I got to sit back and watch as they looked up the rules in the PHB and discussed which was right. I just got them all to agree after their discussion (the right answer is 1d6, btw). A little later during a different scenario, I asked the 2d12 player “are you sure that’s in the rules, or are you making that up?” When he admitted to not being sure, and that he made up the specifics, I let him have it, because he wanted to cast witch bolt into a Beserkers Iron Greataxe, because, according to his logic, channeling the lightning into a metal weapon would cause the creatures arms to freeze up from convulsions, allowing the rest of the party to attack the relatively imobilized monster. It was an awesome idea, so I said “sure, go for it”. Epic. Each kid is totally different in how they want to play, and what they want to get out of the game. It’s taken me a while to figure out each player, and we lost a few while I was still learning how to be 10 again, and I’m still a long way from being good. About 3 sessions into playing with these guys, I learned to “give up on what I think this game should look like, and figure out what they want it to look like and then go with it” … Since then, it’s been getting better and better each session. I wrap up each session quickly, and we’ve learned to “figure out XP, HP and the like” during the beginning of the next session. It gives us time to wrap up properly, without being pressed for time, and it lets us all get reacquainted when we all get back together. To play Hoard of the Dragon, I read through the entire published book. I’ve copied some maps and painted them. I also read all of Sly Fourish’s tips (priceless) and I’d spent 9 sessions playing The Lost Mines of Phandelver with these kids. For each session, I now prep with about 15-30 minutes of “work” and then let the kids set up the session once we’re all at the table together. It’s taken us a while to get to this point, but I’m proud of the kids and happy with how they’re playing. 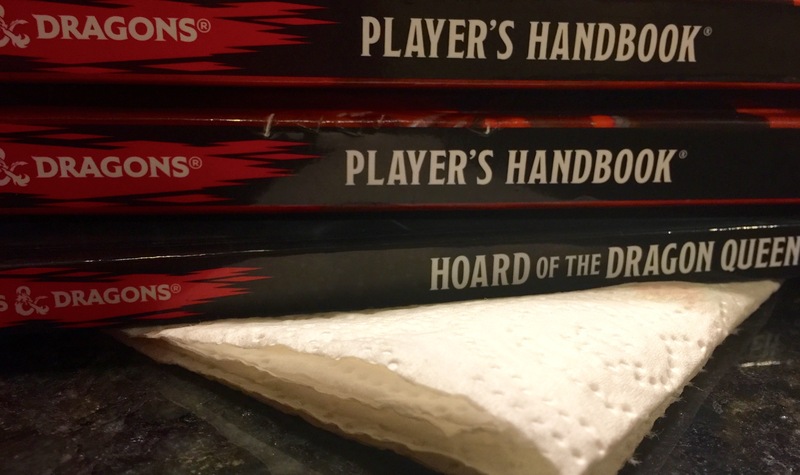 We’ve been playing a Hoard of the Dragon Queen, which is the first of two adventures in the Tyranny of Dragons story arc, published by Wizards of the Coast. In the hard cover version of the adventure, the artwork is… well, art. 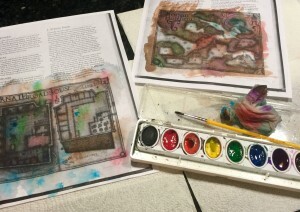 It’s gorgeous, but making color copies for my players isn’t cheap! My challenge playing with 10-year-olds is that they aren’t great note takers or map makers, so to make it more fun for them, I usually photo copy the maps in the book and hand them to the players, but black and white maps aren’t that cool… and I’m honestly not that interested in paying for color ink (or buying a color copier). 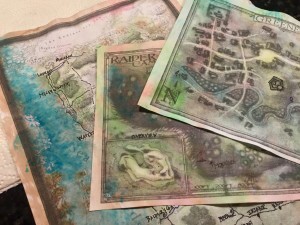 My laminated maps also get re-used quite a bit because they’re sturdy and easy to keep track of. I have a box (the D&D Starer Kit box, in fact) full of maps that we’ve played with. The kids that I’m playing with love the “added color” and it really enhances their game, while at the same time being easy for me. It’s a fast way to add a little color to your game. 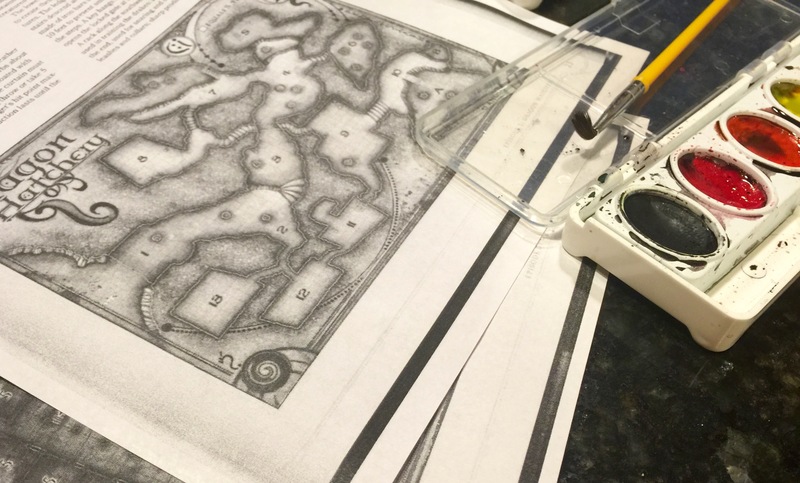 You can give your own personal maps the same kind of treatment. It really adds some depth, especially if you’re playing with a map that your characters find on an NPC after they’ve slayed that NPC. Protip: add a little red to add a little blood to the map… adds depth like you wouldn’t believe. Try it during your next session and let me know if it helps enhance your game! One of our players is playing a 1st level Sorcerer, and he chose Chromatic Orb as a starting spell. The challenge with Chromatic Orb, is that it has a component requirement that costs 50 gp, and that’s a lot for a starting character, He didn’t buy a diamond at the beginning of our sessions, but he should have… and I didn’t realize that at the time, so we’ve been trying to figure out how to work the spell into the game. Chromatic Orb (PHB, pg. 221) is a cool spell. It does 3d8 damage of the type you choose, but you have to have a 50 gp diamond to cast it! Tough at first level, unless you just give it to your character. Two questions: why would the character choose to learn that spell, if they didn’t already have a diamond? Could you allow them to start with it, if they choose that spell? DM Tip: Give them the diamond to start as part of their starting equipment. Or, if you want them to earn it, there’s no reason that your PCs can’t find a 50 gp diamond on their first mission/quest, especially if it helps further the story! A faction the PC can help, or leader asking for help, could offer a diamond as a reward, or an enterprising PC could negotiate or even steal one. Obtaining a 50 gp diamond could even be a side quest for a 1st-level rogue. 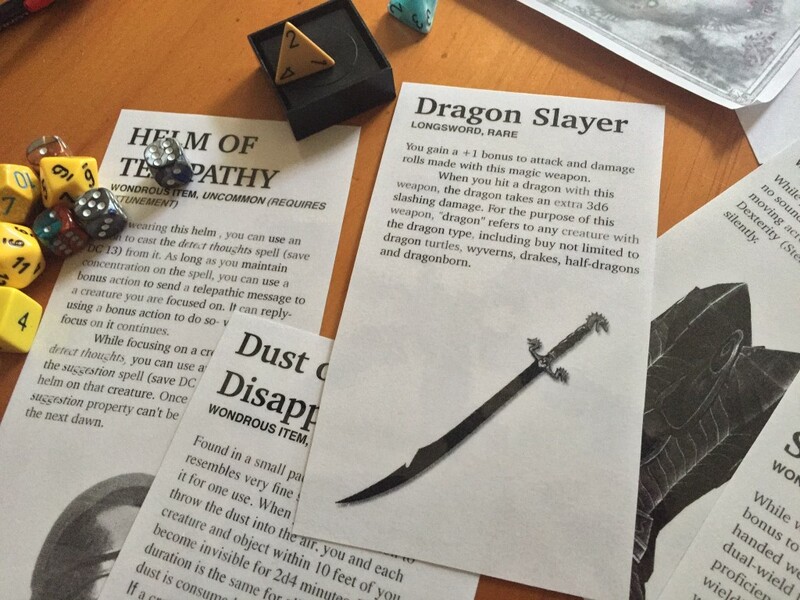 DM Tip: Give a 1st-Level character a 200-300 gp reward for their first gaming session somehow, so they can just purchase a diamond, if you can’t work a diamond into the story line. If you can work a gift or reward into the story, even better. I’m going to talk to the players about the other spells that this Sorcerer could have chosen to learn, so that they understand all of the character’s options. Consider that there are 4 other spells that a Sorcerer could choose: Burning Hands, Magic Missile, Thunderwave and Witch Bolt, perhaps? Each of those has a relatively powerful offensive quality that could compliment or replace Chromatic Orb. Chromatic Orb does damage to one target of your choosing within 90 feet. Your energy orb does 3d8 acid, cold, fire, lightning, poison, or thunder damage, again, you choose. Seriously boss spell. Note: you have to own a 50 gp diamond to do this spell, but that diamond doesn’t get consumed on use (see page 203 in the Player’s Handbook: Material Components). Just keep it in your component pouch after you obtain a suitable diamond! Magic Missile shoots 3 darts that do 1d4+1 force damage, and are pretty much guaranteed to hit your target of choice. Thunderwave moves everything in a 15 foot cube in front of you 10 feet back, if it’s not nailed down! Also deals 2d8 thunder damage to all creatures in that cube, if they fail a saving throw (1/2 damage on successful saving throw). Failed saving throw also moves that creature 10 feet back. Lastly, the spell booms a thunderous boom for 300 feet around you. Witch Bolt does 1d12 lightning damage that manifests itself as an arc of energy between you and your target, which can be repeated every turn until you do something else. The only downside is that you might get stuck for a few turns. If you have the diamond, Chromatic Orb is a great spell choice for a 1st level spell caster. If you don’t there are a few other good spells that could replace Chromatic Orb, depending on your style of play. If you’re the DM, make sure they start with a suitable diamond somehow! Special thanks to the D&D 5th Edition Wiki folks for the online references! Dungeons & Dragons has always been a “game of the imagination” for me, but as I’ve been playing DM for the 10-year olds that my son plays with, I’ve learned a few things about playing with 10-year olds in 2015. One of the things I’ve learned is that they love loot, but they aren’t very good at writing down all of the details about the items they’ve won or found. To make it easier for the kids to keep track of their loot, I’ve started making cards with all of the details on them. And even better, when I hand the players these item cards, I tell them “you have the only one of these in the world, so don’t lose it” and they keep track of them, or their character loses that item! I use Keynote to make the cards, just because the interface is super clean, but you could also use Microsoft Word, or even Google Docs. 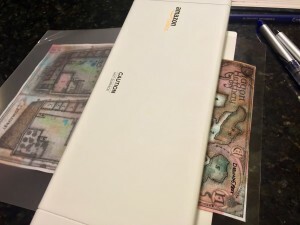 To make the cards, I either create an item from scratch, or I copy the details from the Dungeon Master’s Guide or whatever source I’ve found for the item. The item description, with whatever effects it has for the wearer/owner. I use a 2-column layout so that each card is roughly one-column wide, meaning I can get 2-3 or maybe even 4 items on a sheet of paper. I also try to keep the font choices and font styles the same on the item cards, so that they look good for the players. Then I laminate the cards using a laminator I picked up from Amazon, with these laminating sheets. 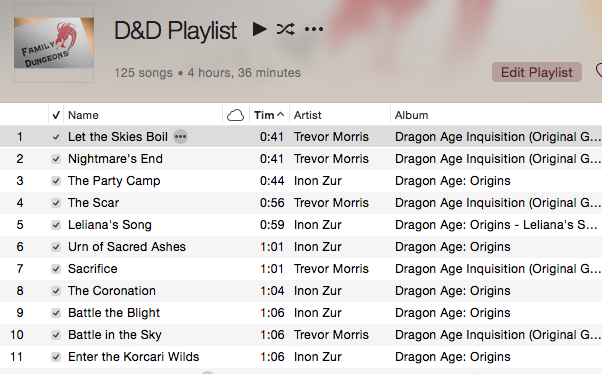 I’ve always believed that a good playlist of background music always helps make a Dungeons & Dragons session go better. We’ve got an Apple TV hooked up to our living room TV, which is connected to a Bose Cinemate sound system, so right before a D&D session, I queue up my “D&D Playlist” from iTunes on my computer, and stream it through the Bose. For Example: “Call His Wrath” by Trevor Moris on the Dragon Age Inquisition soundtrack is an amazing track to have playing in the background. Especially if you have a semi-decent subwoofer. Listen to the preview on Amazon here. I’ll add more to that list, as I find more music. Would love to know your suggestions too. What do you play in the background during D&D sessions?